At left: H. J. Hodgins, 98.183.01. At right: actor Spencer Tracy. Among the young portraits on a 1919 Marquette University Dental School graduation record is the face of H. J. Hodgins. Harry, as Dr. Hodgins was known around town, came from the Wisconsin university to Sitka in 1920, only a short time after graduating. 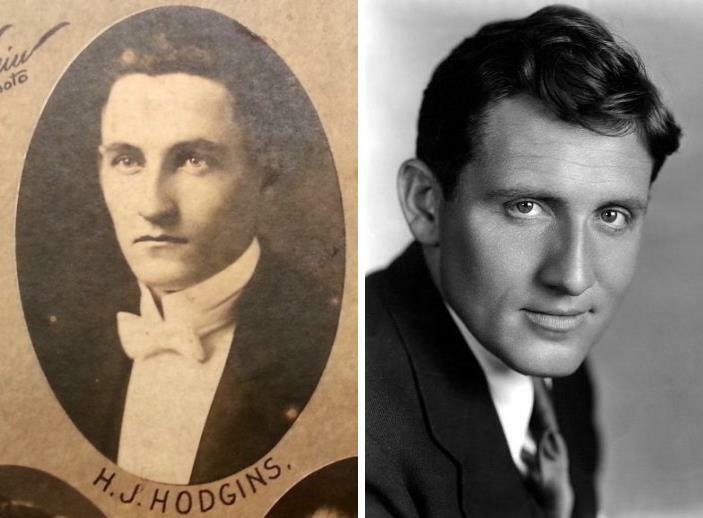 His yearbook entry tells of an energetic young man who, “besides his ability to entertain with weird tales and his mastery in dentistry, also gained fame as an orator.” Hodgins was a handsome man and friends said he looked just like famous actor Spencer Tracy. A debonair suit and bowtie completed Hodgins’s signature look about town. But Hodgins is perhaps best remembered as Sitka’s first dentist. For decades Hodgins was the only dentist in Sitka and he became well known around Southeast Alaska, as he traveled from town to town to perform dental work. He also served as an executive member of the Alaska Dental Society. He would journey to Chichagof Island to provide dental work to the gold miners using his portable dental chair. He would spend all day working on the miner’s teeth and stayed up all night playing poker with them. Hodgins loved card games and could often be found playing poker or bridge with friends. His skill won him prizes at bridge tournaments many a time throughout the years. Hodgins also enjoyed hunting, but always traveled with friends so they could hunt during the day and play cards by night. Ted Kettleson, superintendent of the Sitka Pioneer Home and one of Hodgins’ favorite hunting buddies, regularly went to Hodgins’ cabin at Telegraph Creek in Canada. One particular harrowing hunting trip almost took the lives of both men, along with two others. 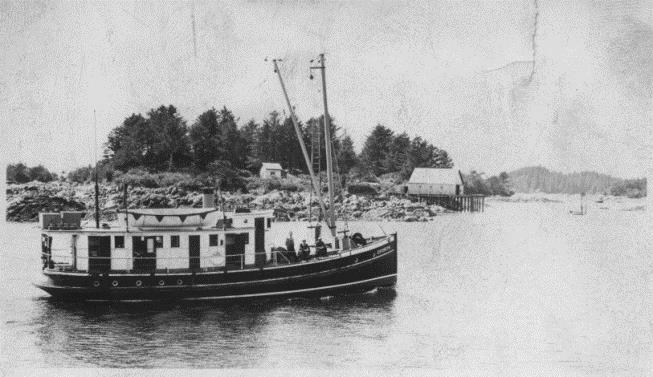 On a Friday afternoon in December of 1930, Alfred Tilson, Captain Hugo Frederickson, Hodgins and Kettleson were traveling back to Sitka when their ship hit rough waters near Steamboat Channel. The ship’s engine failed when water entered the ignition system. Wind tore away the sail. Waves swept the ship towards land and, despite the men’s efforts, smashed it against a pinnacle rock. The men salvaged items from the wreck including guns, food, ropes and blankets. They rigged pockets out of the rope and blankets, which they used to anchor themselves to the rock for over 40 hours. The Estebeth. Sitka History Museum, PH13140, The Sitka Photo Shop Studio. Sunday morning, the men observed a mail ship, the Estebeth, and shot off their guns with the hope that those on board would hear them. Thankfully, the Captain and First Mate did hear them and investigated. It was another hour before the ship was able to send a lifeboat to the bruised and battered men. Undaunted, the friends continued to go on hunting trips together for years. Hodgins warm and outgoing nature extended to close friends and newcomers alike. When new dentists came to town, Hodgins welcomed them as comrades. One dentist remembers when he first came to Sitka and could only afford one dental chair for his new practice. Hodgins insisted he needed a second chair in order to build a successful practice. Hodgins used his connections with the local bank to help the young dentist secure a loan. As a foundational member of The First Bank of Sitka, Hodgins maintained a position on the Board of Directors even after the National Bank of Alaska purchased the bank. Hodgins quietly used this advantageous position to help improve the lives of those around him. Josephine passed away in August of 1965. Sometime after, Hodgins met Connie Reeder Whittemore and they married in 1971. Together they traveled extensively and continued to be active in the community. Hodgins passed away in 1975 and is buried in the Sitka National Cemetery. Although an unsung hero in Sitka’s history (perhaps because few people really enjoy going to the dentist) his larger than life personality, adventurous spirit and generosity earned him a place in the hearts of the many townspeople he connected with. 1988 Services Scheduled For Connie Hodgins. October 31:3. 1953 Professional Men Active in Civic and Club Affairs. January 16:6. 1930 Cling to Rock Until Rescue Comes. December 6:3.